A Sunflower Life: The Best Scrambled Eggs Ever! I’ve reached the top five on the Gourmet Live 50 Women Game-Changers list. This week’s focus is M.F.K. Fisher, who is considered the inventor of food writing and may be the best ever at this craft. Mary Frances Kennedy Fisher grew up the daughter of a newspaper man and was an avid reader. Throughout a life filled with numerous travels, financial hardship, a world war, and failed marriages, Fisher chronicled her food observations. To learn more about her check out her foundation’s website or, better still, read her books. Now, I have a confession. Even though I had heard about Fisher for years, I’d never read any of her books until last week. Well, that error in my food education has changed thanks to my local library. Her writing is wonderful—flowing and clever with a bit of humor. Most of her books don’t contain recipes in the traditional form. Many are incorporated into the narrative of the story. 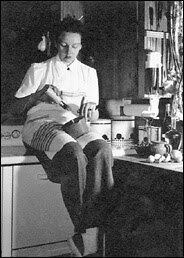 If you’re not familiar with her work, make sure to get a copy of The Art of Eating, which is a compilation of a number of her books, including my favorites How to Cook a Wolf (tips on cooking during World War II’s rationing and shortages), The Gastronomical Me (considered her most autobiographical and best book), and An Alphabet for Gourmets (a series of essays written for Gourmet magazine.) A copy of the book is on its way to my home as we speak since I’m sure the library would like their copy back. I had trouble picking just one recipe to make in Fisher’s honor. After lengthy consideration and multiple mind changes, I settled on one that appears in at least two of her books: Scrambled Eggs. This dish doesn’t take a lot of effort, but it does take up to 30 minute to make, but believe me when I say it is worth the time. Even The Picky Eater enjoyed the eggs’ tender, fluffy consistency. He even tried mine with chopped garlic chives on top! I will never make scrambled eggs any other way ever again. 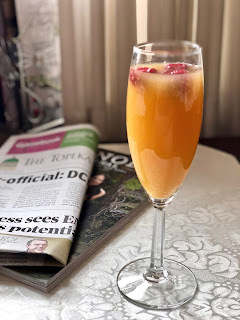 I started this journey through the list of 50 Women Game-Changers in food with a group of fellow bloggers from around the world. If you would like to read about their efforts, Taryn at Have Kitchen Will Feed has compiled a list of each week’s contributions. I really must get her book. Minus the cream, my mom made scrambled eggs like that. She'd break them into a pan and slowly fold them together. The final texture and flavor is amazing. And just in time for Sunday breakfast, I'll try the cream method. Lea Ann, I was a bit nervous about starting in a cold pan without any fat added, but the eggs stuck to the bottom the same as my usual method. Amazing! Marina and Heather, she is such a wonderful writer, which inspires me to make my writing even better. I just wanted to stop back in and remark about how good these were. I didn't have cream as I thought I did and used milk. Worked fine, but I can't imagine how they'll be with cream. I agree, I was a bit nervous about the whole thing, but worked like a charm. My mom used to put a little bacon grease in a skillet and crack the whole eggs in, then slow cook. Lea Ann, I'm glad they worked for you, even with milk. The cream probably makes them richer in flavor. Plus, they did have a butter taste to them, which I guess makes sense considering that's where butter comes from. :) My mom used to fry eggs in bacon drippings--yum. I don't know if she made scrambled that way...just don't remember. I loved this post, brilliant! I fancy some eggs now! Love it! Such a good reminder that I need to catch up on my MFK Fisher!! I too have only recently delved into the works of Fisher, which is a shame really because as you say, her writing is quite inspiring. I too better add at least one of her books to my library. The eggs look and sound fabulous!